The Witches� Almanac has long featured black and white images of beautiful woodcuts, fantastical creatures, tarot cards, astrological features and constellations, as well as line drawing selected from the folklore of our global community. 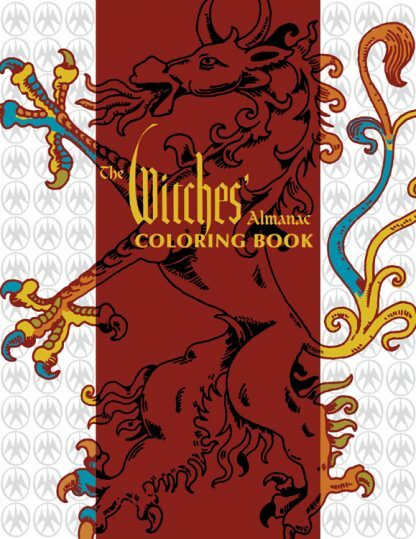 The Witches� Almanac Coloring Book brings together a larger format of these images presented in past Almanacs (in addition to images that have not been presented) allowing the inner artist to emerge in a mediation of color. Neatly packed into seven distinct sections, the first fittingly is Woodcuts. When they first appeared in Europe, woodcuts had thick outlines and little shading. A printer inked the block and applied light pressure to transfer the lines to paper. After the ink dried, another craftsperson might color the images by hand. In other words, the process was very much like a coloring book today, except that today you are the colorist. The six remaining sections are Constellations, The Planets, Creatures, Egyptian, Americas and Tarot. Each provides for the artist the space to meditate on the imagery imbuing each with color. The aspiring Tarot reader should especially enjoy the final section where each of the 22 Major Arcana and the four Aces are provided.